Interesting to see the mix, MD. I am a big fan of diversification as I find that no one can expect how things will change. Two years ago, you couldnt have to gone wrong with investing in oil/energy companies but now, companies are cutting dividends and their safety is questioned - so, I find that the best course of action is to diversify. I find myself leaning a bit heavily towards financials as well - and inside that, a big chunk comes from REITs. I think between traditional financials and REITs - I receive almost a third of my dividend income - which is a bit high -- but like you said, each of these companies (such as POW) itself is diversified. Nice post - always good to see articles on diversification. Thanks for the kind words R2R. You actually gave me the idea to write this post. I know you have a similar chart with a graph where you detail the diversification of your income source. Financials and REITs are the usual suspects, aren't they. It's hard to avoid these guys, but one has to be careful no to rely too heavily on them. Your take on oil is a good example. A lot of people are bummed with Kinder Morgan and COP for instance. Thanks for commenting! I have never run those numbers, but I think I'd be very close to 45% between financials and energy. 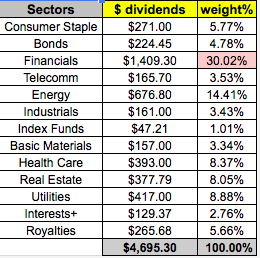 Although R2R is much better diversified than I am, I think it's pretty common for Canadian dividend investors to weigh those two sectors quite heavily, along with telecomm. tu as vendu tes actions de Suncor?? ?